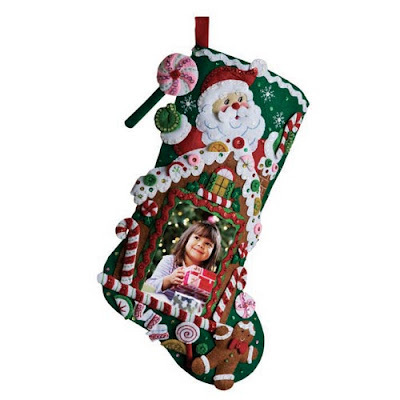 One of my personal favorite Christmas craft kits are the felt stocking kits. I love having a handmade unique stocking for each member of our family. Being able to personalize a Christmas stocking removes the generic appearance and gives our Christmas decor overall a more family oriented "home" feel. This Gingerbread Frame Felt Stocking kit is really adorable! I used it myself when I made a stocking for our latest addition to our family. Now, I didn't want to use the gingerbread house as a photo frame as shown, so I simply added a door and windows to mine. There was plenty of felt to cut out a simple door and 2 windows. This Gingerbread Frame Felt Stocking kit by Bucilla includes the colored felts with the designs stamped on them to make it easy for you to cut out and embellish the stocking. The kit also includes cotton floss, beads and sequins which truly add dimension and detail to the stocking. If you want the gingerbread man or any of the images to have a puffed appearance, you will need to purchase the Fibre Fill Stuffing separately. Keep in mind, you don't have to always stick to the kit pattern. You may only want the Santa or Gingerbread man to add to a pre-made stocking. I have cut out and used the stamped felt pieces from stocking kits many times on other crafts too.